When I write something for this blog there have to be pictures. And believe me, I have lots to choose from. I shoot a dish until it is cold and all the herbs look wilted. But when it comes to publishing, I try to limit these shots to one or two pictures per post. Because who wants to see a picture of the same muffin from all its angles until you have finally made it to the recipe? Well on my blog you usually have to wade through words over words instead of pictures. Last week I wrote that I ate the same breakfast almost every day. And then I changed it. I am really not the person to pull out a pan for breakfast but sometimes I make an exception for tofu scramble. It’s quick and you don’t have to stand by the pan all the time, so I think it’s okay. I made this with tofu, bell peppers, onions, sunflower seeds, soy sauce, salt, and pepper. The weather was great and I wanted something bright for lunch. Therefore I made a salad from cooked spelt berries, roasted asparagus, tomatoes, and cucumber. This was great to take to work and we also had some leftovers for the next day. The funny thing is that I bought the asparagus because F insisted we buy it. She was talking about it at the grocery store all the time. And then of course she didn’t touch it. 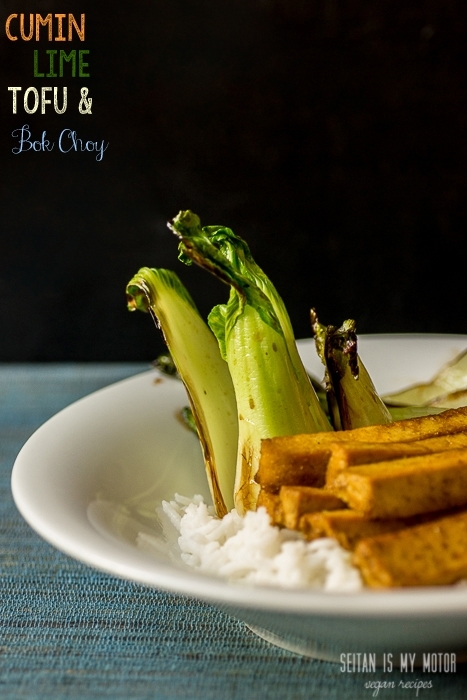 For dinner we had fried bok choy with teriyaki sauce, rice and Dreena’s excellent Cumin Lime Tofu, which you can find in the book Eat, Drink, and Be Vegan. It’s an older cookbook but still one of my favourites. There are so many simple but still interesting enough recipes in it and many have become staple dishes for us. With this baked tofu recipe you can never go wrong. I usually cut the lime juice a bit and don’t use the pumpkin seeds called for, but that are all the changes I make. Of course there was some baking, too. 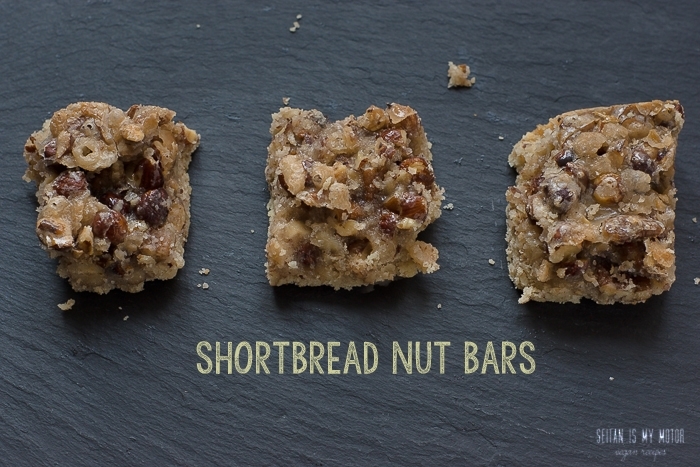 I wanted to update my nut bar recipe but I probably made one too many adaptions. They fell apart when I tried to cut them and I didn’t like the slightly gritty texture of the topping. But they tasted great! We ate way too many. Happy Wednesday! What did you eat? 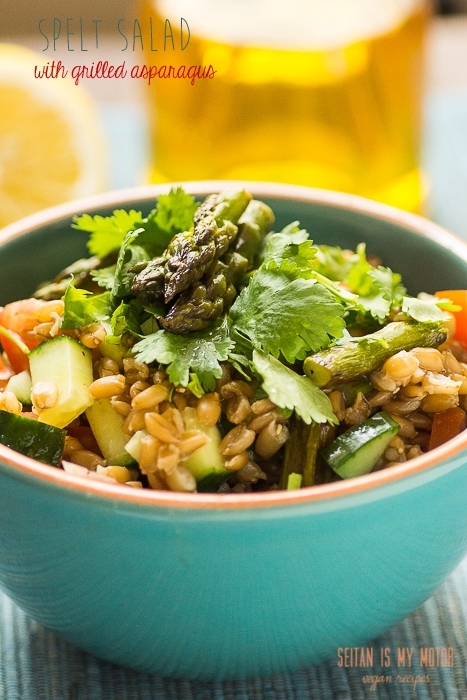 I want that salad and the baked tofu – exactly the sort of thing I love but sometimes just don’t have the energy for – and I love how F wanted asparagus and wouldn’t touch it – kids! 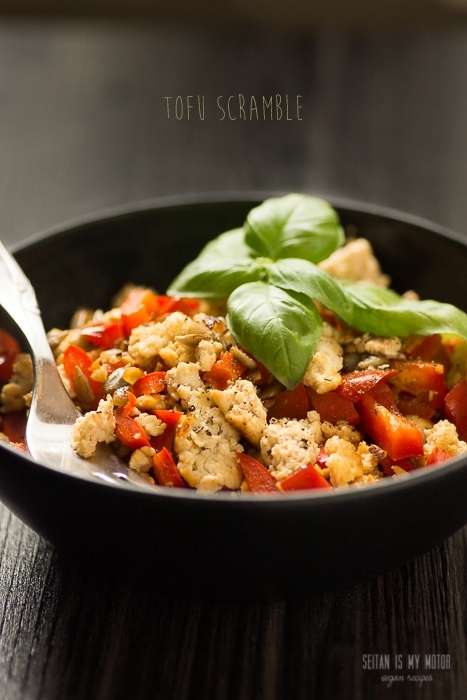 I love tofu scramble! It’s my go to breakfast on days that I don’t workout (on those days I drink smoothies.). Beautiful pics as always. The black background on the cumin lime tofu picture is really sending me. Just gorgeous! Today, Wednesday, I started with a smoothie (banana, cherries, mango, hemp, chia, almonds, water). For lunch there will be leftover lentil, potato and cabbage soup, and dinner is still unplanned, but I’m leaning towards corn cakes with a side of kale. None of these things are particularly photogenic, so I may have to wait until next week to join the Wednesday group! Your food, as usual, looks gorgeous. That sounds very delicious, especially the soup and the smoothie. And I never had corn cakes. I have completely lost track of the things my daughter’s enthusiasm has convinced me to buy or plant the past seven years. A couple of years ago she had was determined to find the biggest, most gorgeous head of purple cabbage at our farmers’ market for Father’s Day – and I alone ended up eating slaw and pickled cabbage for the next three weeks. But thanks to her, I now have several crowns of purple asparagus, a field of purple shiso, a ten-foot row of the darkest tomatoes I’ve ever laid eyes on, and more culinary lavender than I know what to do with. I’ve started giving her all of my seed catalogues before I place an order and just add the items I want to her list. Your photos are beautiful, as always. The baked tofu has me intrigued enough to consider adding yet another cookbook to my kitchen library. I’m really excited to see that someone else besides me likes their scrambles not-sopping-wet! And the Vegan Wednesday meme is lovely! It might get me out of my blog rut (Instagram has made microblogging a little bit too convenient). I love what the kids come up with. I am in the lucky position that my daughter will refuse something once and then she’ll usually try it. I am super envious of all your vegetables. I think I really need a garden. Ich hab nussecken gebacken und fürs Caramell statt zucker selbstgemachten Löwenzahnhonig verwendet (die Nüsse waren allerdings recht fein gehackt). Agavendicksaft oder sowas könnte ich mir auch vorstellen, zumindest um die Kristallation zu verhindern. Das rührtofu sieht lecker aus. Mit Löwenzahnhonig habe ich letztes Jahr gebacken. Das ist eine super Idee.